When the MacGregor 26 came out in, I think the 1980's, I and other sailing purists were horrified. The MacGregor 26, the sailboat that was a motorboat, or vice-versa, had the effrontery to strap a big outboard on the back and become a very quick motorboat, one that could easily pull a water-skier. My thought at the time, "why not just go out and buy a nice little outboard skiff rather than this sailing/motor bastardization?" I'm sure, this was the same thought many other sailors shared. It seemed the the #1 marketing point of the Mac 26 was its motorized performance as shown in this video (this is not what a sailboat is about! What about the ambience, the wind and the waves?). I recently had a conversation with Jim, a retired boat dealer, 35 years in the industry, and he couldn't say enough good things about the MacGregor 26, enough praise to make me feel that my first knee-jerk reaction may have been unwarranted. Eleven thousand of the 26's were built, seven thousand in the U.S and four thousand distributed world wide. Those numbers alone make the MacGregor 26 one of the most successful small cruising sailboats ever built. Jim told me this real life story of one of his customers to demonstrate the capabilities of the MacGregor 26. Two fathers with their sons trailer launched their MacGregor 26 out of West River one Friday night and motored the mile or so over to Rhode River to spend the night off of one of the small islands. Saturday morning, early, they blasted over the flat calm waters of Chesapeake Bay to where the fish were biting. They fished all morning, grabbed a lunch in the spacious cabin, and, with the breeze up, filled the ballast tanks for a pleasant sail back to the take out ramp at West River. A great family boat because the kids got to do the things they enjoyed; water skiing, tubing and not so much the things they found boring, such as drifting in light air. Plus you could get to the anchorages quick enough to enjoy swimming and hanging out with other kids. A very roomy interior. With the MacGregor 26, designer Roger MacGregor anticipated the latest "French" styling of Beneteau and Jenneau with the high freeboard and swoopy coach-roof, all in the name of interior space. Decent sailing performance. Jim is an accomplished sailor and took the MacGregor 26 over to the Bahamas and did a circumnavigation of the Outer Banks. Trailerable, so you could get to a place to sail to the Bahamas or the Outer Banks. Or you could just pull in to a beach. I must admit, I've never been on a MacGregor 26 (overall though, I haven't been on many different cruising sailboats so that isn't much of a surprise). After my conversation with Jim, I will give Roger MacGregor credit. It appears he was a design genius to successfully combine all these capabilities in one boat (my sailing snobbishness aside). 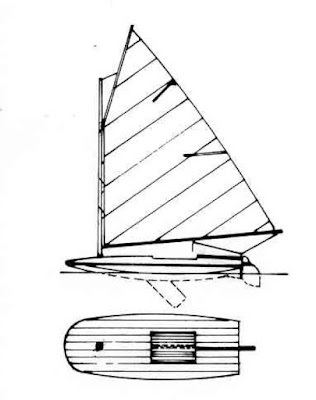 Here is a drawing of the MacGregor 26M, which I think was the last model of the 26 (the 26X was the first). Thanks to bluefreeyachts.com.au where I got the image. Plenty of MacGregor 26 cruising videos up on YouTube. Here is one of them. The Bursledon Blogger got this right. The previous header photo was of a beach gathering of the traditional lug-rigged dinghies from France's Arcachon Bay. You can read more about the traditional sailboats of the Arcachon Bay over here. Music Whenever: Lord Huron "Fool for Love"
During early summer, this song was getting a lot of play time on the local WHFS station. The song is about a crazy-in-love lunk who goes after the girl only to get the crap beat out of him by her bigger and more violent boyfriend. So, in this song, we have an underdog who loses big time. Despite the outcome, the song is still one of my favorites of 2015. I have found scanned-in, one-sheet, Larken Klasse plans kicking around the Internet. They are amazingly detailed for one sheet (just have Google Translate handy if you are not Dutch). Click the pop-out icon in the top right corner to open in a new tab. Click the zoom-in magnifying glass icon. This will give you a slider control to change zoom magnification. The original post on the Larken Klasse can be found here. 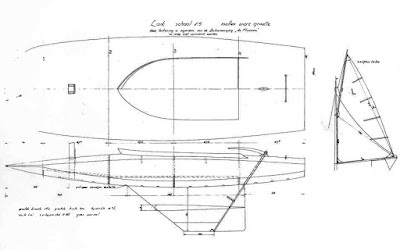 As mentioned in my post on the Lark Scow - The Laser of the 1900's, Thomas Day of The Rudder magazine encouraged the home-builders of the Lark to be inventive; there was no strong concept of one-design strictness at this genesis of small sailboat development. So builders strayed from the plans, building Larks with yachty looking counter sterns, with cuddy cabins, longer and shorter Larks and they gleefully sent reports of their modifications into The Rudder and Thomas Day published them. In 1903, in The Netherlands, W. Beekhuis, owner of the boat building yard "Navis" te Loosdrecht, built a small Lark, only 3.6 meters long (11.8 feet). He built them from the time period 1903-1905 but it is unclear how many he actually produced. In 1919, A Van Gool, from the northern coastal district of Friesland, The Netherlands, built a Beekhuis type Lark with additional modifications. 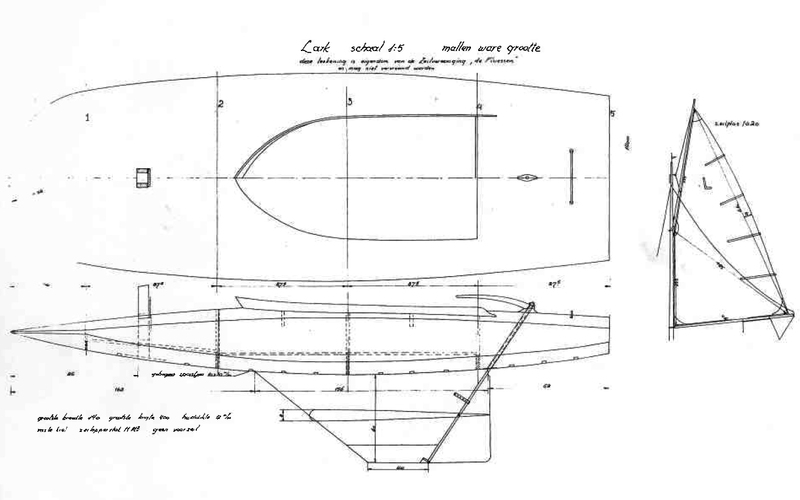 Having traveled to America and observed American sailboats, Van Gool borrowed the Star type keel and grafted it on the Beekhuis Lark scow hull. He made the hull longer, 4 meters (13.1 feet). He replaced the squat gaff rig with a taller gunter rig. This Larken Klasse would become very popular in Friesland and Twente during the 1920's and 1930's. 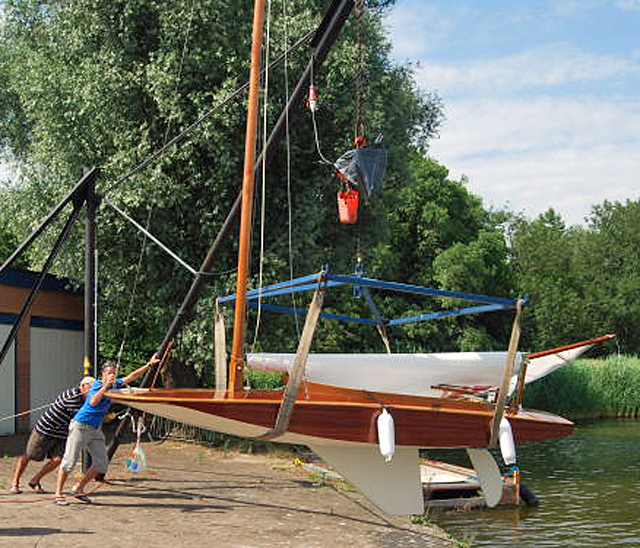 In 1934, Romke Vries designed an even higher aspect, full battened gunter rig for the Larken Klasse. 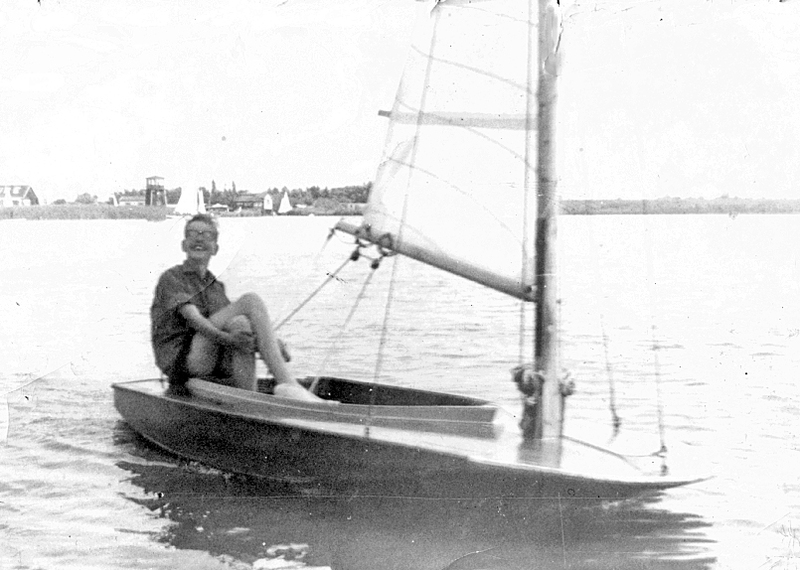 By the end of the 1930's the more modern O-Jolle singlehander centerboarder was cutting into the Larken Klasse numbers and, as the Finn dinghy and OK dinghy were introduced after World War II, the class continued to lose popularity. In 1965, the class made its last appearance at Sneekweek, seemingly destined to fade into obscurity. That is until 2004 where a group of Larken Klasse enthusiasts banded together to start restoring the old Larkens and build new ones. In the short span of 11 years they have built the class up to where they are now getting a vibrant 20+ turnout at the major regattas. An amazing resurrection of a true classic! 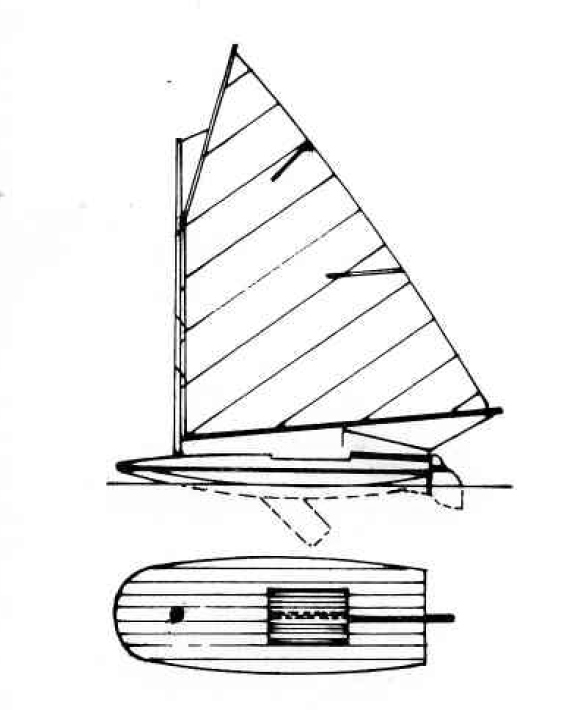 The newer Larkens have adopted a more modern keel with a separate rudder. The lead ballast is 34 kg. A vintage photo of a happy Larken skipper. At this years Sneekweek regatta, artist and small boat racing enthusiast, Jan Tekstra decided to jump into a different class each day and record his race on a GoPro. This is his Larken segment. As I was tossing this post around my brain, the German Segel Reporter beat me to it by about two weeks and brought out Michael Kunst's post on the Larken Klasse. I don't know how I missed this but several years ago, sailing coach Dan Brandt at Richmond Yacht Club introduced a Laser with an Opti rig. 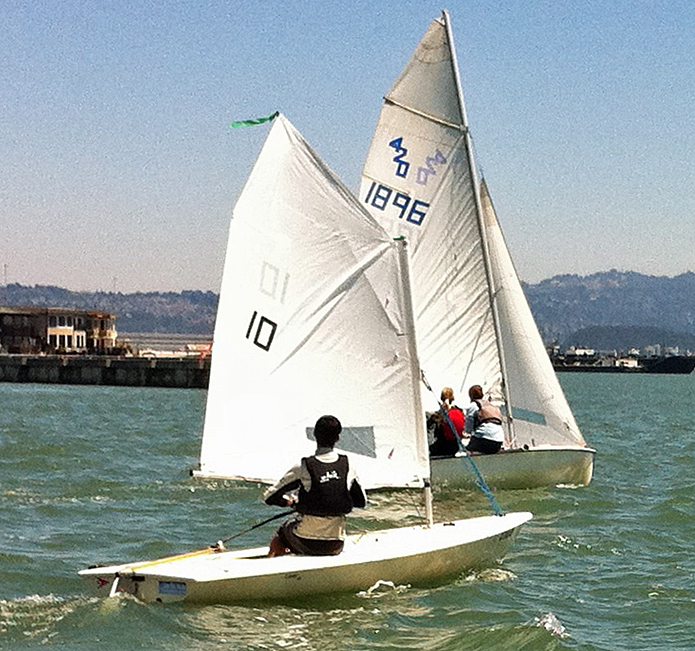 I would imagine Richmond Yacht Club, being just off to one side of the very windy and choppy Berkeley Circle on San Francisco Bay, would find a very depowered Laser of great use for their junior sailors. Come to think of it, at this time in my life, this is just my speed for racing a Laser in anything over twenty knots. 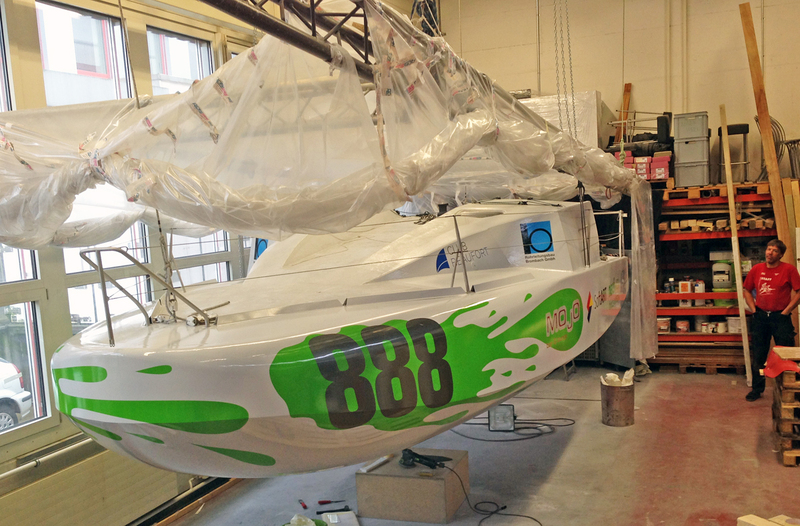 More info on the L'Opti can be found here. Also, at about the same time the L'Opti came out (2011) there was, that year, another performance rig introduced for a Laser. "The 55th Three Rivers Race was the first time aerial photography was allowed by organisers, Horning Sailing Club. Richard Kemp of Skyhover used an octocopter to photograph the start of the race . The three rivers from which the race gets its name are the three northern rivers of the Broads (Norfolk, UK), the Bure, Ant and Thurne. There are numerous Windmills and pumps such as the white Thurne Mill along the route. At first the race sounds simple, an out and back course, in which you must round four marks and return to the start. It begins to sound trickier when you discover the course is in the order of fifty miles in length. It requires great planning and skill to navigate in unpredictable tides and variable winds. Many of the classes are for historic boats built in Norfolk and Suffolk for the difficult local conditions: such as the River Cruiser (first built 100 years ago) Yare & Bure One Design, Norfolk Punt. The greatest outsider challenge comes from the extremely fast Thames A Raters." Navigators & General Three Rivers Race 2015 from Skyhover Aerial Video Norfolk on Vimeo. The previous header photo featured a French Classic Moth Mariposa (Spanish for butterfly) sailing in tandem with a Nantais Vintage Moth (blue sail) at the French annual Classic Moth rally and regatta which was held yearly during the early 2000's. The strong sheer gives Mariposa a traditional look which suggests a traditional round bottom shape. Nope. 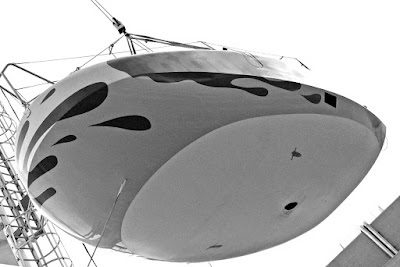 The header photo above is an optical illusion as other photos reveal that Mariposa is actually a multi-chine plywood shape (a three-planker) with the bow sections developed and pulled up. Mariposa has a flat rocker panel that starts just in front of the daggerboard case and a topside chine that curves up to meet the gunwhale about 600mm from the bow. The developed bow suggests this Moth was built using the stitch and glue method. The French Classic Mothists weigh their Moths like the Americans - on a bathroom scale. The scratched up bottom shows that Mariposa is not a coddled racing dinghy - and gets plenty of use. An in-the-water shot of Mariposa shows the topside chine clearly disappearing into the gunwhale. This Moth design is visually appealing - Mariposa may not be much of a racer but that's OK. The designer is the tall gentleman on the left. I have no idea who he is. Maybe some reader could help out on identification? Update, August 14: Dominique Banse to the rescue with the designer indentification. Thanks Dominique! "There is an article about this Moth in the French magazine “Chasse-Marée” number 147 from November 2001. The owner builder’s name is Bertrand Warion. 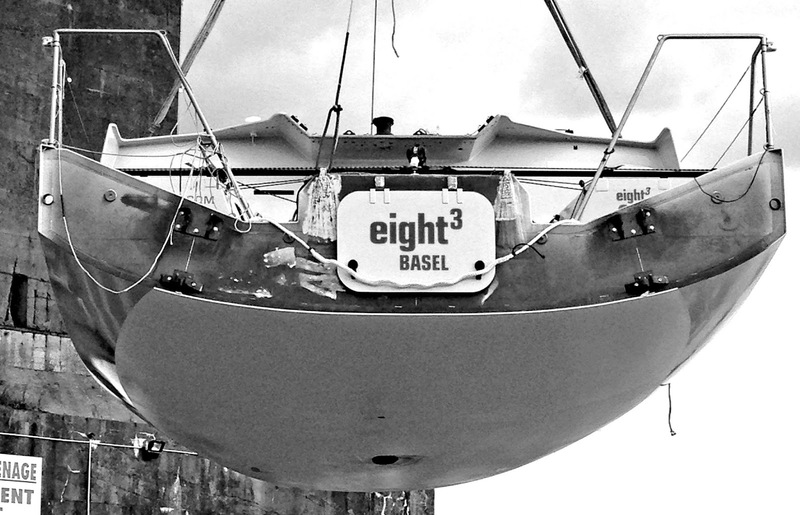 The boat is built with 5mm plywood and weights 76 kg." Update September 29, 2015: Designer Bertrand Warion adds a comment to this post updating us on the latest with Mariposa. "Hello ,I am Bertrand Warion who designed Mariposa and usual reader of your blog. The boat is still in good condition with great modifications, large cuts to flatten the bottom rocker and new cockpit plan, more "modern" but quite unconfortable for me. [I am] thinking to ameliorate that point. 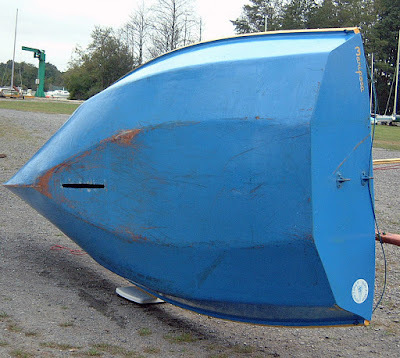 I did not sail Mariposa [for] 5 years (leaving job, town) and [now] mainly designing and building others boats but i will recondition the boat soon. Here are some new Mariposa pics. There are a few enterprising readers of this post who could put together their own version of Mariposa, at least in model form. Earwigoagin is always open to publicizing such design experimentation. Through the early 2000's the French Classic Mothists held an annual get together. I think it was originally held at one of the clubs on the Seine but then moved over to a small lake about 100 km. south of Paris, sponsored by Cercle de la Voile du Centre, Etang du Puits, (Google translation - the pond of the well), just off the Route d'Argent. Though well attended, in a mystery still not explained, the annual French Classic Moth gathering and regatta just stopped. [Mystery somewhat explained - see below] . The mystery of the French Classic Moth get-together got somewhat clearer when reader Dominique Banse emailed an article from a 2001 issue of Chasse-Marée, the French classic/traditional boating magazine. It turns out that all these photos were taken at a Classic Moth design competition that was sponsored by Chasse-Marée and held at Suc d'Erdre, just north of Nantes (and not at Etang du Puits as I wrote initially). 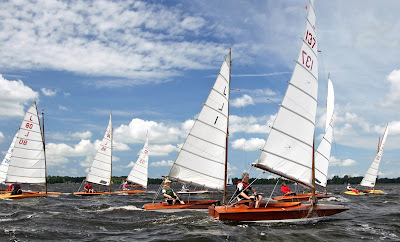 There was a turn out of 20 Moths Classique, both new designs and old, as well as several IMCA narrow skiffs. There is still no explanation why the Classic Moths in France could not keep the annual event going after 2001. I recently rediscovered on the Web, photos from Marc Morell (who took all the photos used in this post) documenting the Suc d'Erdre. The diversity of French Classic Moths is just astounding! I'll feed more of these photos into later posts on Earwigoagin. In the discussion of what are the fastest planing angles for hiking singlehanders (see the comments to this post) and how to determine them, Jim Champ sent along a link to his excellent how-to article on using a smartphone as a GPS course tracker. In following his procedure, except for the smartphone, everything else seems to be free. Highly recommended reading for the geeky sailor somewhat strapped for cash. This video covers this summer's Supernova National Championship and is one of the better sailing dinghy drone videos now flooding the Internet. Though the video is a little bit long for my taste (and the music sometime jarring to my old ears), it is a high quality production by Limitless Image Aerial Photography. The Supernova is an English hiking singlehander, one of a plethora of singlehanded dinghies thriving in the English market. It is considered a big guy singlehander sporting a full battened rig on a stayed mast. The Supernova Facebook page can be found here. Of a tactical note: Despite the huge onus the new rules put on coming in on port tack at the weather mark, it seems a lot of sailors still do it. This is a neat video of racing canoes on the Coco Keeling Islands, a small group of islands in the middle of nowhere, Indian Ocean, about 1/2 way between the west coast of Australian and Sri Lanka. They look to be a hybrid of western and native influences. The double-ended, narrow hull features a chined, deep Vee with a large, straight keel log, made necessary because it doesn't appear that they carry a center board or daggerboard. The rig is a squat main/jib, Bermudian in planform. These canoes seem strictly for racing. Cocos Keeling Islands - Hari Raya Jukong Racing 2015 from Rik Soderlund on Vimeo. Tillerman just posted about planing RS Aeros and courses designed for planing singlehanders. This brought to my mind the D course I modified* for just that and the unintended but humorous results when I sprang the D Course on the unsuspecting Classic Moth fleet at their 2013 Nationals (hence the moniker "Dammit" course). I still think the D course has potential. For hiking, cat rigged singlehanders the fastest planing angles seem to be just below a close reach, or a course slightly lower than 90 degrees to the wind. I remember as a PRO back in the 1980's running a Chesapeake Bay Olympic training event and the Europe dinghies had something similar, though if my memory serves, they ran their close reach into an extra mark about 1/2 way between the windward and leeward marks. When the southerly came up, on that reach, the Europes really scooted. The D course has a curly-cue rounding at the leeward mark. A starboard rounding might be better but I have found that racers are so attuned to going around marks-to-port that they get confused when you change this up. I offer up the D course details in the following PDF. I'm always interested in what other racers or RC thinkers may come up with in designing planing courses for hiking singlehanders. I think one of the keys is to come up with the angle to the true wind your singlehander is sailing when it is planing the quickest. Data anyone? Dave Raison, in his latest scow Mini Transat 6.5, won the Mini Fastnet this past June. There are now other scow Mini 6.5's appearing. Swiss Simon Koster put one together he has named eight Cubed after the number he sails under. Included below are some photos of his new creation. 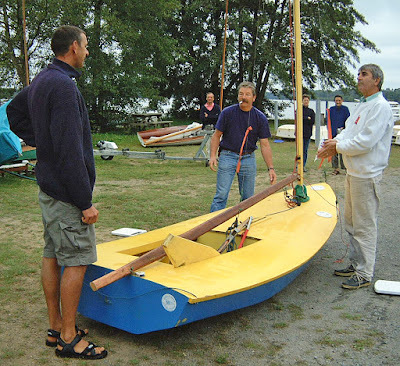 Make no bones about, these sailboats are Uglee.....High freeboard on a scow shape is not pretty. Simon Koster waved the ugly stick even more by making his cabin top very blocky. From the The Simpsons, a quote by bartender Moe before he underwent plastic surgery. "I've been called ugly, pug-ugly, fugly, pug-fugly, but never ugly-ugly." I'll go with pug ugly. I like scows. I like different. I like that, with these shapes, form follows function. Some would call these Mini 6.5 scows cute. (Can you call a sailboat cute?). From this bottom-up, bow-on angle, combined with the paint scheme, eight Cubed appears to have the bottom of a rubber ducky bathroom toy. Ah! That's more like it. The familiar wide arse of a Mini-Transat 6.5. You can see the odd split, blocky looking, almost comical cabin house with forward facing window in this photo of eight Cubed hanging in the shop before the initial launch. A video of the start of the Mini-Fastnet. Winner David Raison in #865 with the distinctive blue jib can be seen starting about 56 seconds into the video and then at 2:20. 8-Cubed shows up at the 1:43 mark.